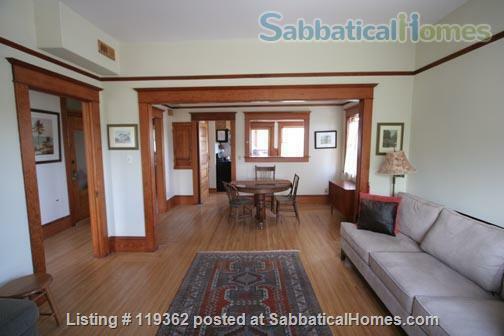 Beautifully renovated turn-of-the-century two-bedroom flat in the heart of Berkeley. Great flow, gorgeous oak floors, high ceilings, original details, claw foot tub on a marble floor, granite countertops in kitchen, dining room, and sunroom with washer and dryer. Small, sunny backyard. A dream for those who prefer not to drive-- walk (or bike) to downtown, to BART (metro that goes to San Francisco, airports, and beyond), to U.C. Berkeley (just 6 blocks away), to the Farmer's Market, to parks, and to restaurants and cafes, the nearest of which is just two blocks away. Private schools (Montessori, Berkwood Hedg), and public schools (Washington Elementary School just around the corner, Berkeley High School a block away) close by. and lots of counter space. I have hosted many visiting scholars, including with families, affiliated with different institutes and departments at UC, and everybody always has a pleasant stay. Fully furnished.